Great Geordie Golf Day fit for The Princes Trust! A Glenmuir shirt for all 200 players! The sun was shining bright for tee off as the golfers made their way out for the shot gun start, 100 players on The Colt Course & 100 on The Filly. On course challenges ahead included Beat The Lady Pro from European Golf Challenge, trick shot challenges from Kevin Carpenter & Geoff Swain as well as a 20K car up for grabs. 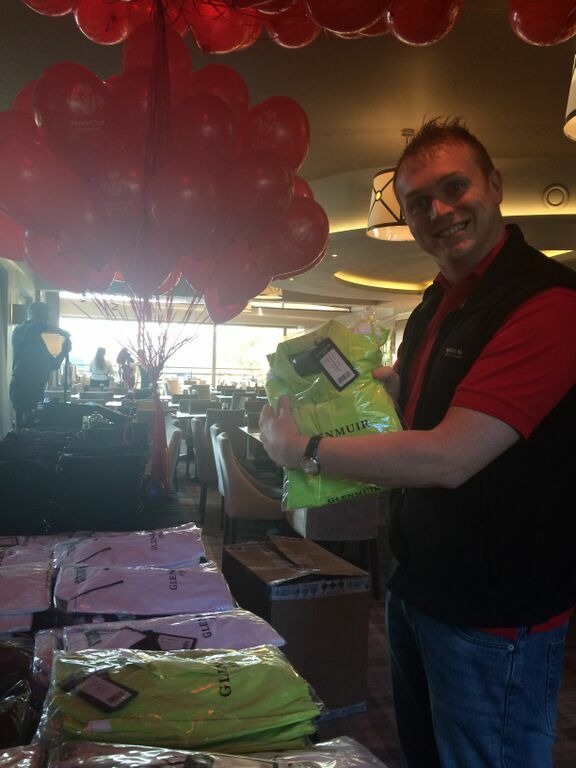 Armed with all those goodies & their mulligan balloons the golfers were set to go! Justin Fraser Jones of GolfBoard UK pictured above, made his debut out on the course with something new to add to the hole in one challenge with Golf Day Gloss. Yes, surfing the 10th fairway of The Colt Course!! After taking their shot at a hole in one to WIN an Audi A1 courtesy of Benfield Motors, players were given the opportunity to surf up to the green on the GolfBoard! Everyone who surfed the earth took to it like a duck to water...some closer to the water than others, as they sped off along the side of the lake towards the green! All good fun & we think there may be a few GolfBoards going on the forthcoming Golfers Christmas Wish Lists as a result! Along with an Audi A1 of course, as sadly no winner this time round. Professional Golfer Carly Booth, taking her best shot for an Ace to WIN the Audi A1. It was a star studded affair at Close House with a host of North East icons taking part in the day to support The Prince's Trust. These included football legend Alan Shearer, Steve Harper, John Beresford & Rob Lee. The event was followed by a fantastic Gala Dinner at The Hilton in Gateshead at which Benfield hoped to top last years funds raised of over £50,000. The money goes a long way to support the work of The Prince's Trust helping disadvantaged teenagers in the North East of England. Alan Shearer, a keen supporter of the charity with two of The Prince's Trust fantastic volunteers. All in all, a very successful day which Golf Day Gloss were proud to be involved with. We would like to thank Benfield Motors & also Close House who were the perfect hosting club.